Convert to Flat File for Excel has a a powerful set of tools aimed at converting a complex Excel report structure into a flat data table. This solution is particularly useful when structured data is required to be used for further analysis in Excel or in other applications such as databases. Convert to Flat File for Excel performs automated reformatting actions, eliminating manual work of operating cell by cell. Convert irregular data structures into flat data table format. Extract data from text reports imported into Excel. Obtain a CSV formatted file from the data conversion process. 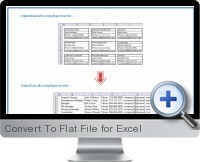 Convert report structures such as headers and footers, multi-line records, data labels and cross tables to flat format. Convert layout features tools: convert data layouts which may come from automated or manually operated reports into a structure of a flat file. Search and reformat tools: modify the structure of the worksheet based on a search, or extract criteria established by the user on the basis of information contents and on data patterns. An automated action is performed each time an occurrence of the searched element is present. Reformatting tools: perform reformatting actions in the process of report layout conversion to a flat file. Data transformation tools: transform cell contents yielding a result that will modify the original data according to a specific purpose e.g. split or concatenate texts into columns using separation characters.